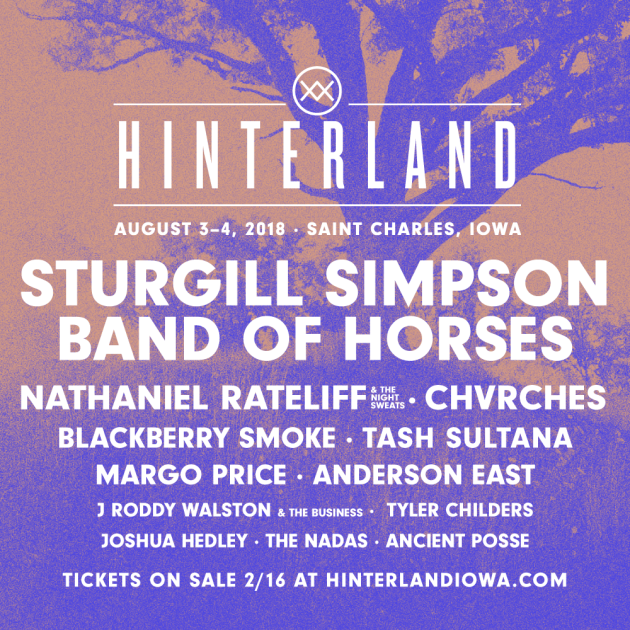 Especially if you’re a fan of Americana/alt-twang music, the newly announced lineup for Iowa’s burgeoning Hinterland Festival might prompt many Twin Citians to consider planning a road trip south the first weekend of August. Sturgill Simpson, Margo Price, Band of Horses, Nathaniel Rateliff & the Night Sweats, Chvrches, J. Roddy Walston & the Business, Anderson East, Blackberry Smoke and Tash Saltana are all featured on the roster for the two-day outdoor bash, taking place Aug. 3-4 at Avenue of the Saints Amphitheater in St. Charles, Iowa, about a half-hour south of Des Moines and four hours from Minneapolis. If the relative proximity didn’t make it tempting enough, then how about the Midwest-modest price? : Two-day tickets are $105, while the VIP pass is $259. They go on sale Feb. 16 at 10 a.m. via HinterlandIowa.com. Camping is available near the amphitheater starting at $25. At least one of those acts, Rateliff & the Night Sweats, has already booked a St. Paul date at the Palace Theatre that same week. Don't be surprised if a few other Hinterlands acts pop in that week, too -- but until we get a decent-sized amphitheater, we'll probably get them indoors. The Des Moines Register's photos and write-ups off last year's Hinterland festival suggest it to be a relatively laid-back and well-laid-out festival.